Today, I had the privilege of appearing on Jay Floyd and Mr. Tug’s PhoulBallz Podcast. 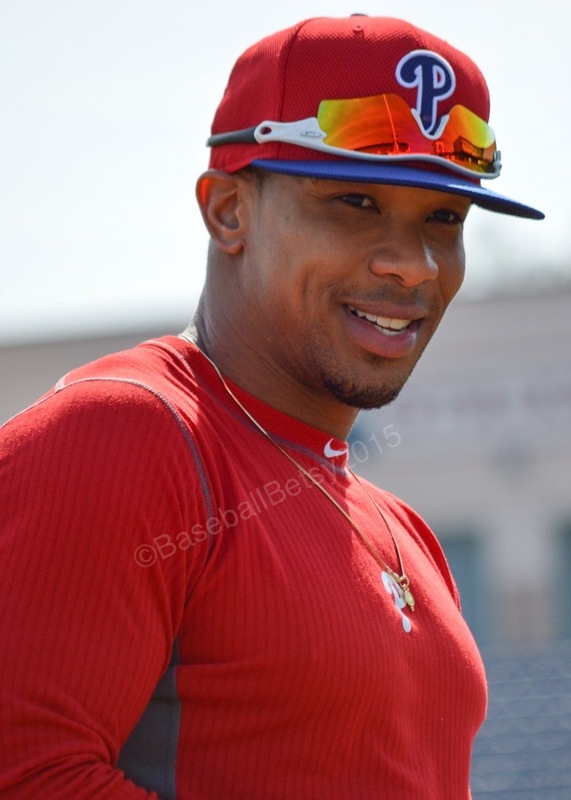 It was really fun as we talked about players like: Ranfi Casimiro, Rhys Hoskins, Grenny Cumana, Carlos Alonso, Perci Garner, Adam Morgan and many more! 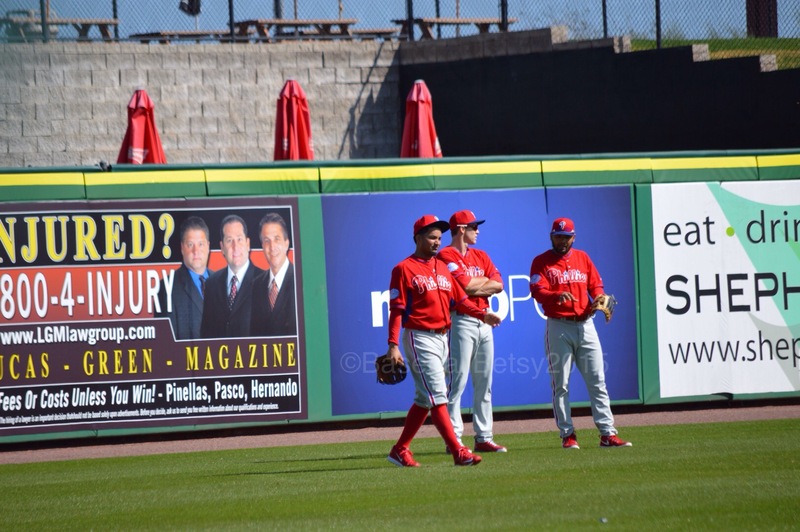 If you’d like to listen, I come in at the 17 minute mark..
Today Cliff Lee hit the mound for the first time since his injury last season. 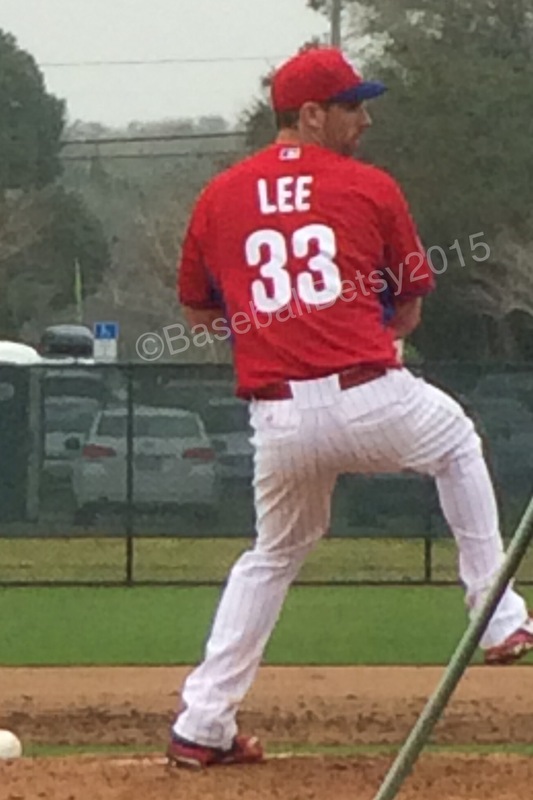 Lee looked mostly like his “Old Self” and didn’t show any signs of discomfort, though he did not pitch very long. Now, while that may look painful to the “Average Joe”, it works for Giles. How many other guys can hit 100? They don’t call him “Hundred Miles Giles” for nothing. This is former Thresher Perci Garner. 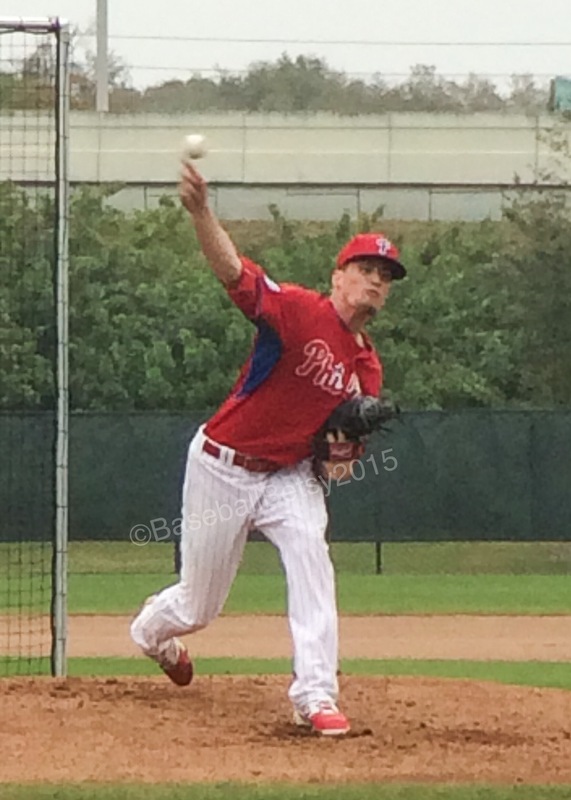 I also filmed Kyle Bogese. Edited to add: If you have headphones, turn up the sound on the videos…the crack of the ball smacking the mitt is astounding. Bogese is an interesting story himself. This Trinity University graduate was discovered in a walk on try out last summer and came to Clearwater late for the Gulf Coast League. He was only one of four players that were found that way. Trinity’s story on Bogese claims he can throw at 97 mph. I can’t verify that as there are no public speed guns at the Carpenter complex. If you study the slow motion video, you can get a little better feel of the force placed on areas such as the elbow or wrist. I thought it was interesting. Upcoming Event: On Friday I will be talking with Jay Floyd of Phoulballz.com on his podcast at 1 p.m. (est). You can find his podcast here. Today I got to pick up one of my “Baseball Sons” at the airport. I was glad to do it, though the craziness of actually getting to get him IN the car was mind-blowing! I made it to airport in plenty of time and sat in the cell phone lot until his flight landed. This is where Groundhog Day happened. My son didn’t have a cell phone so I waited the prescribed 25 minutes after his flight landed then headed to the terminal. On the first pass, I saw him in the terminal, he waved and I pulled to the curb thinking he was on his way through the doors. Then Broomhilda of the TSA pounded on my window and told me to move. Apparently, if your passenger isn’t trying to throw their luggage in the back of your car as you drive by going 35 mph you can’t pause to let them in. So I had to pull out and drive the entire way around airport. Round two: Apparently, my son had to go back to wait for his bags, so before Broomhilda could get her mitts on my car window for the second time, I kept going. Around the airport I went. Round three: This time, I couldn’t see my son anymore. I was worried butthankfully, Broomhilda was on break, so no worries for my windows. Back around the airport again. Round four: After this trip, with my son still not in sight I decided to go park in the short term lot. Let me just say, Dante’s Inferno has nine levels of hell and Tampa International’s garage has twelve levels…so you can get where this is going. I’ve never gotten lost in a parking garage before, hopelessly lost. By the time I gave up, found the exit and spiraled down the nine levels I somehow had gotten up, I came to find that the ONE lane from the garage split into ten different pay kiosks…half of which were closed and the open ones were irregularly spaced with no rhyme or reason as to why that one was open. Upon leaving the pay kiosk, the ten lanes immediately winnow down to THREE with each lane going to a different destination: back into the garage, airport exit and back to the terminal. My problem was that to get to the lane to return to the terminal I had to cut across seven lanes and as soon as you enter the lane for the terminal, three lanes from the main traffic merge into that lane. How I survived, I do not know. It was so good to have my boy back. I delivered him to the Carpenter Complex. He checked in and then was ready to go to his hotel. When we got back to the car, he handed me the gift he had for Ross and I. It was a plaque he had had made, with a picture of him pitching that he had autographed. To the side was a sweet message “to his parents”. The specifics are just for us, but let it suffice it to say, it was literally the sweetest, most thoughtful gift I’ve ever received. It was hard to drive with the tears in my eyes. Knowing that Ross and I have become part of this young man’s life is mind blowing and heart melting. 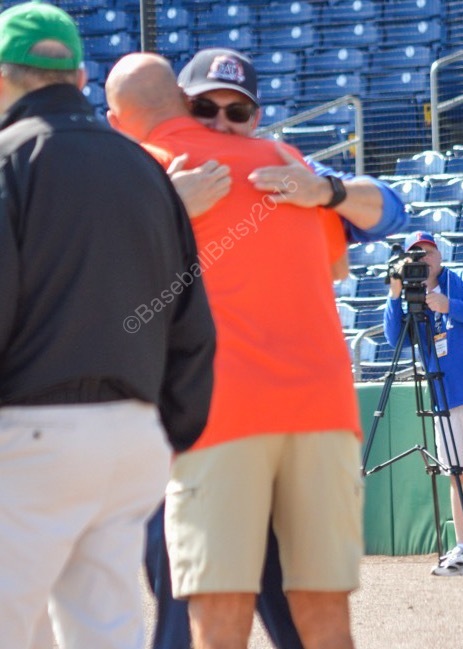 Baseball brought us together. Baseball made us a family. Today was one of those day where there wasn’t a lot of things that were out of the ordinary going on. Pitchers and catchers took batting practice, did drills and ran. 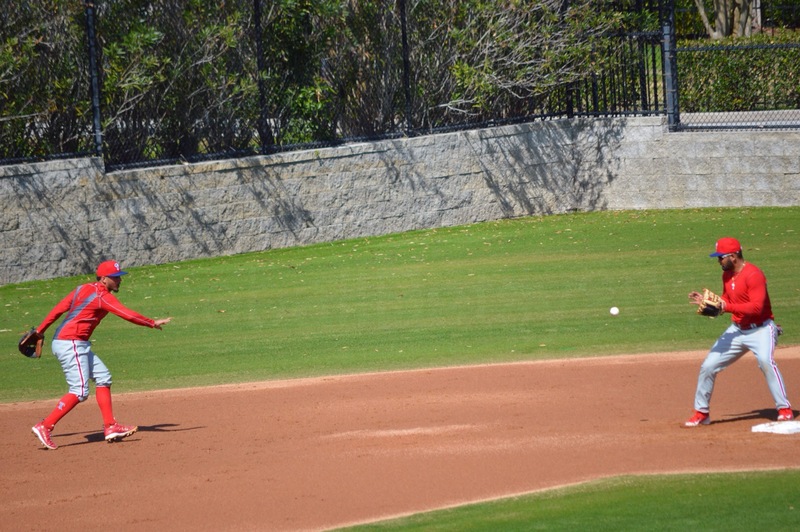 Position players took batting practice and did fielding drills. 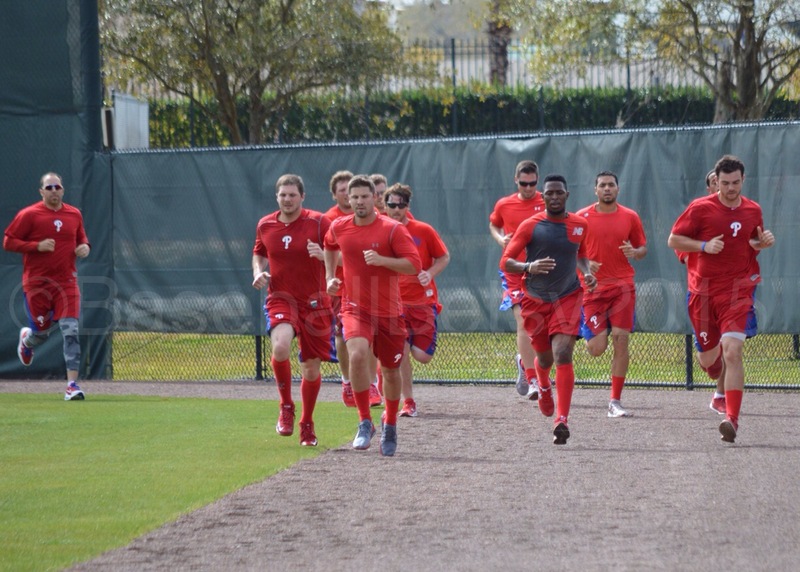 Ryan Howard reportedly was at Brighthouse taking batting practice, but we did not make it over there Later in the afternoon, there was some workouts/long tossing by the minor leaguers that have reported early. I think that sometimes a picture can speak more than a lot of esoteric comments on what is going on. So I present some pictures…. 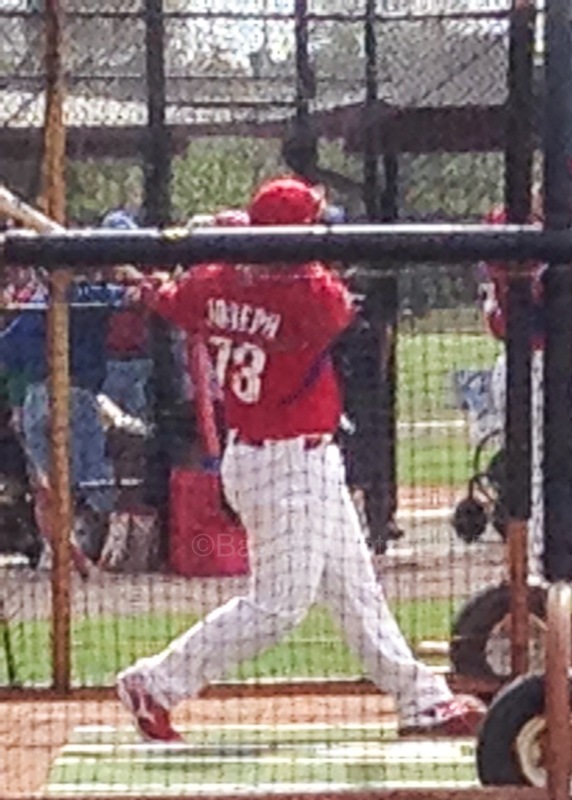 Baseball Ross snapped this pic of Tommy Joseph whom Ross said was looking good. 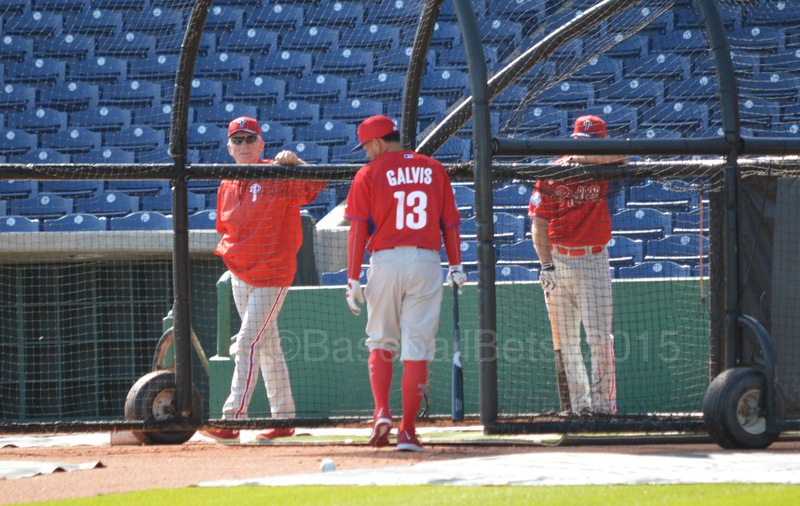 Freddy Galvis is the man of the hour. 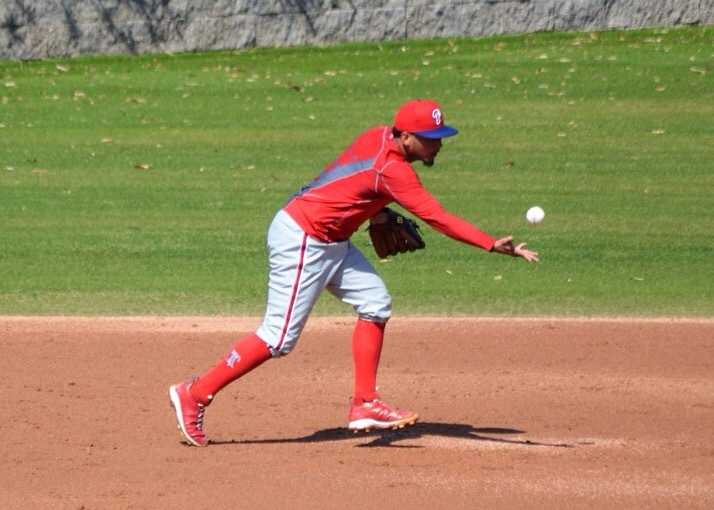 With the Jimmy Rollins trade, Galvis has been the one to watch…and it seems that everyone IS watching. 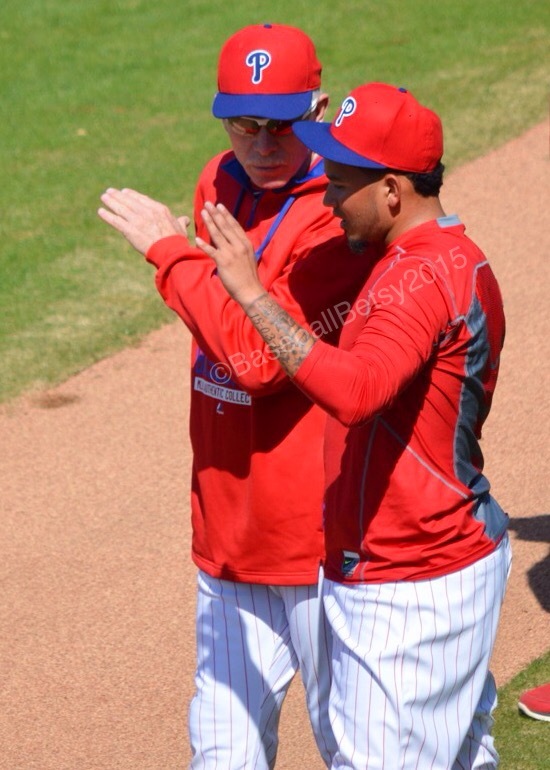 For Galvis, he seems to be putting on a how-to clinic and showing he deserves the starting role. 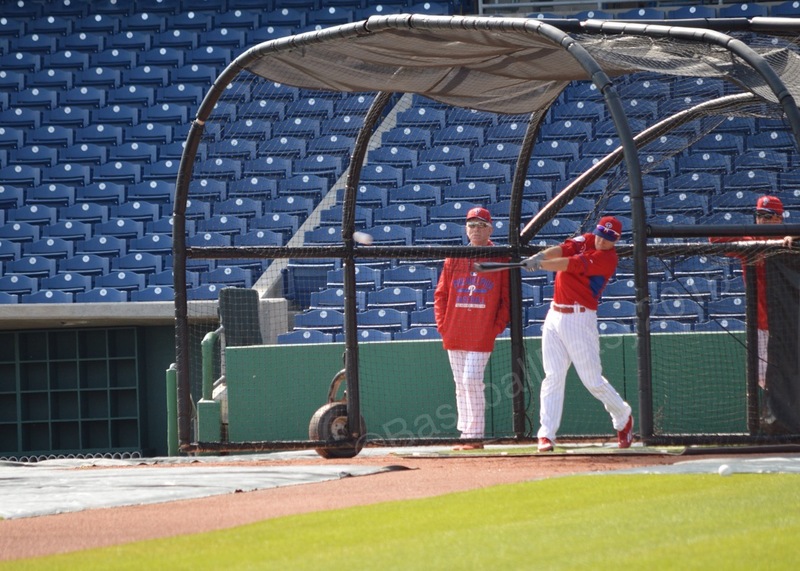 Below, hitting instructor Mike Schmidt offers pointers as Galvis enters the batting cage. 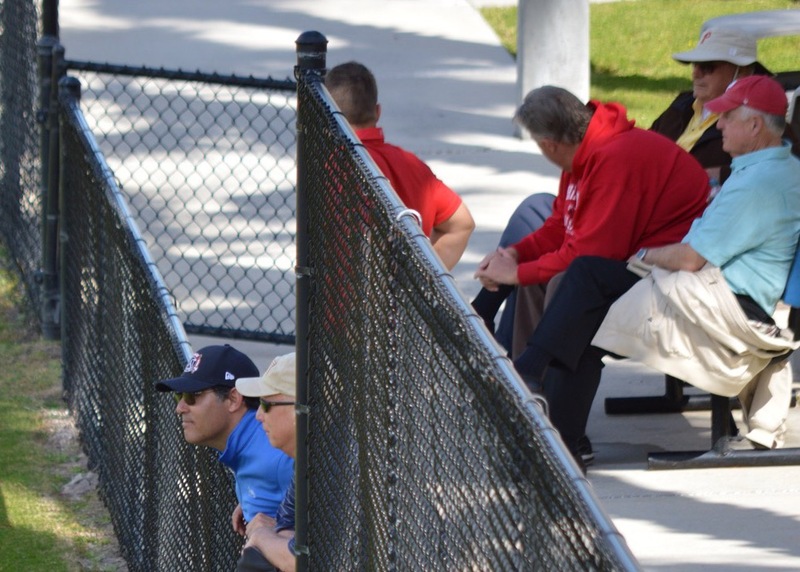 When I say everyone has their eyes on Galvis, I mean everyone in the Phillies’ front office as shown below where they are watching Galvis during infield drills. Like the star of the show, Galvis even signed autographs. 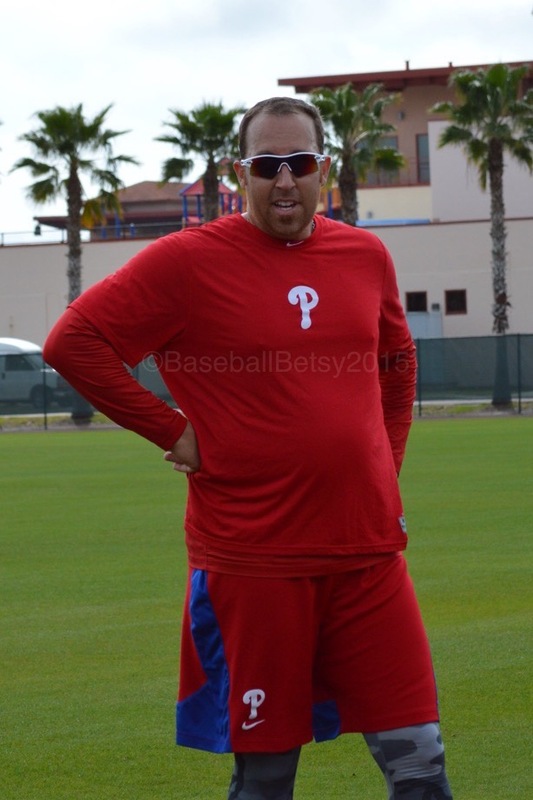 You see, last spring a friend of mine came a cross a bat of Galvis’ that had been discarded since it was broken. My friend knew what a baseball fan I am so he rescued it and I returned home from a Spring Training game last season to find it gleaming in the late afternoon sun on my front porch. So today, I took my very first game used bat to the field with the goal of getting it signed. 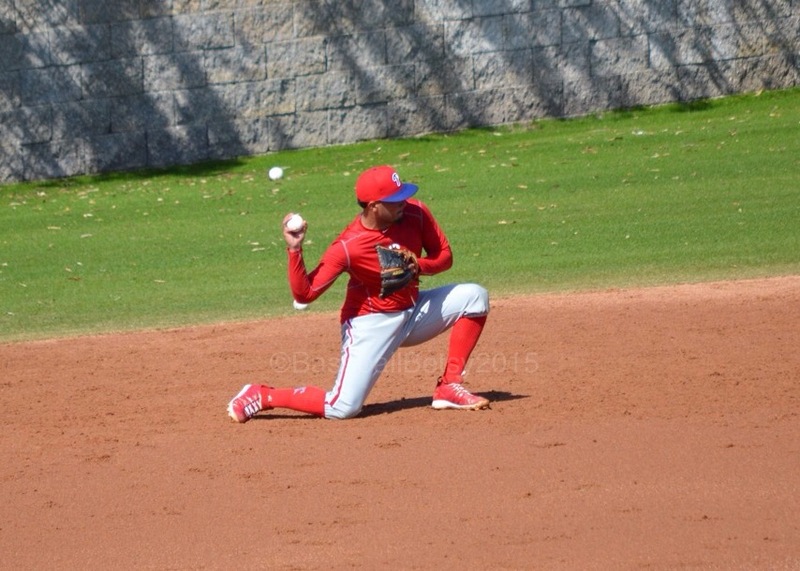 After Galvis finished batting, I asked if he could sign before he went to the outfield…he said he’d get me when he was finished, however, he was called to the half field to practice in front of the brass so he could not return. 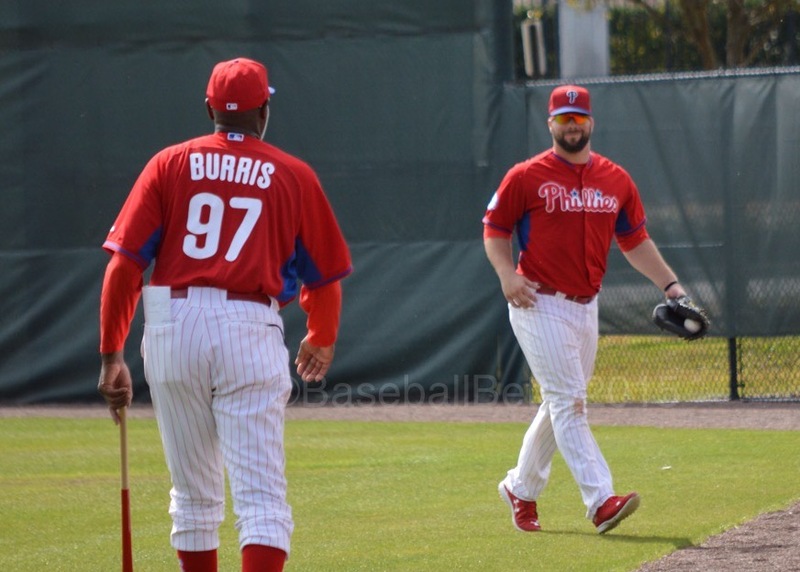 Later, Baseball Ross saw him over at the Carpenter Complex taking bunting practice, again in front of the brass, so I trotted over there. When he was done, he saw me and came over. I have to say this is one of the most meticulous autographs I’ve ever gotten and I am so appreciative that he did such a great job. To put the proverbial cherry on my “sundae”, I happened to run into a friend who “restores” broken bats. My friend can take a broken bat (even one that’s unstable like mine) and work his magic to make it look almost like new. He offered to work on the crack on my bat so I won’t have to worry about it splitting in the future. There’s not many people in this world I’d trust one of my prized possessions to, but this guy’s the best. So in a few days I’ll have a really nice piece for my collection. 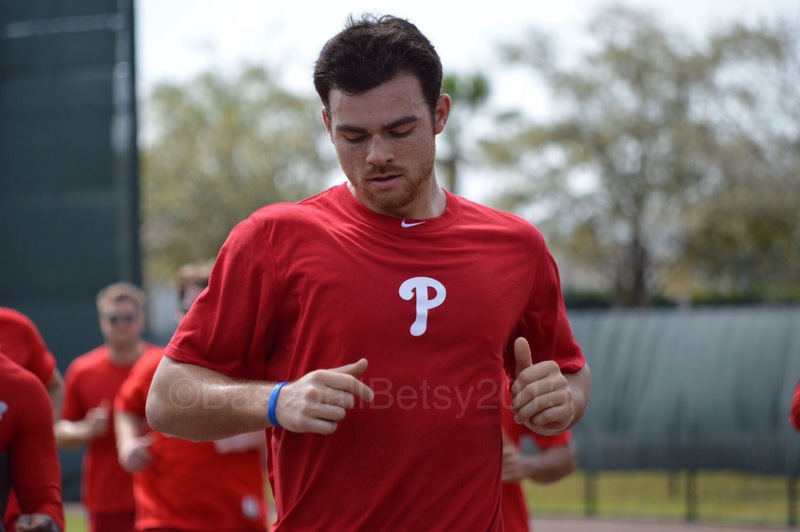 I’m so glad I have the opportunity to spend every day in the sun at Spring Training. It’s one of the best things I know. 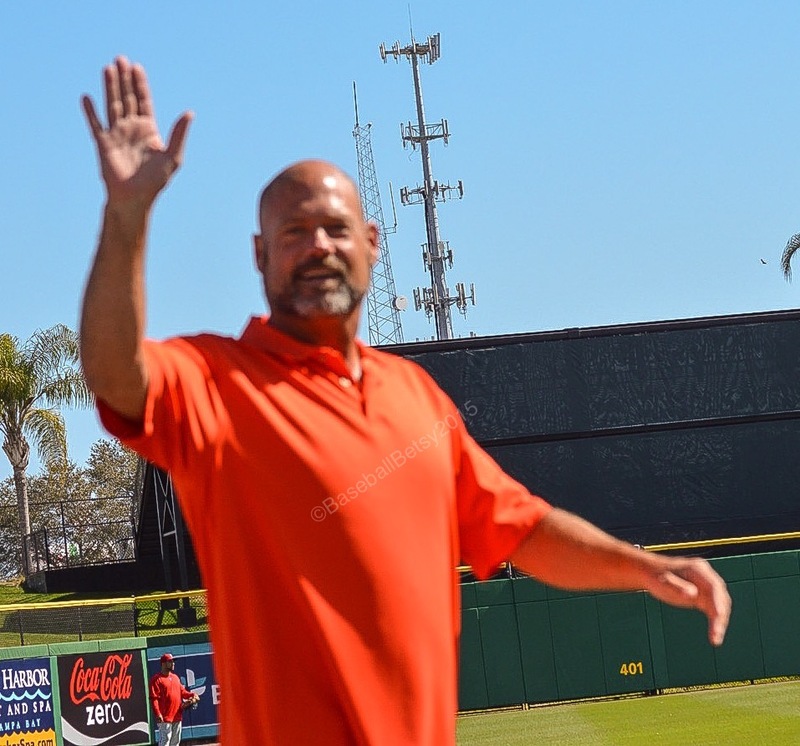 Today was one of those great days that you will remember for years to come as one of those days where you brag, “I WAS THERE!” Today, Darren Dalton announced he is now free of cancer and he returned to Brighthouse Field for Spring Training. 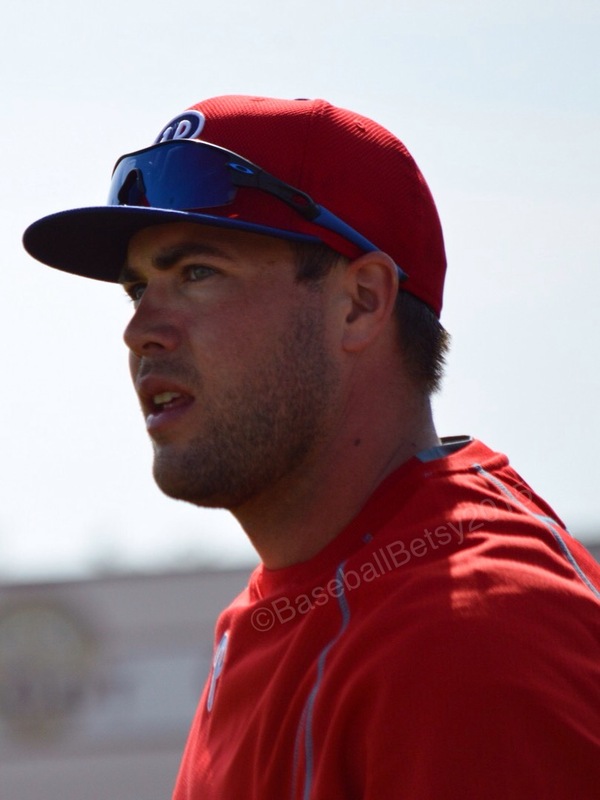 If you’d like more details of Daulton’s ordeal please read HERE. 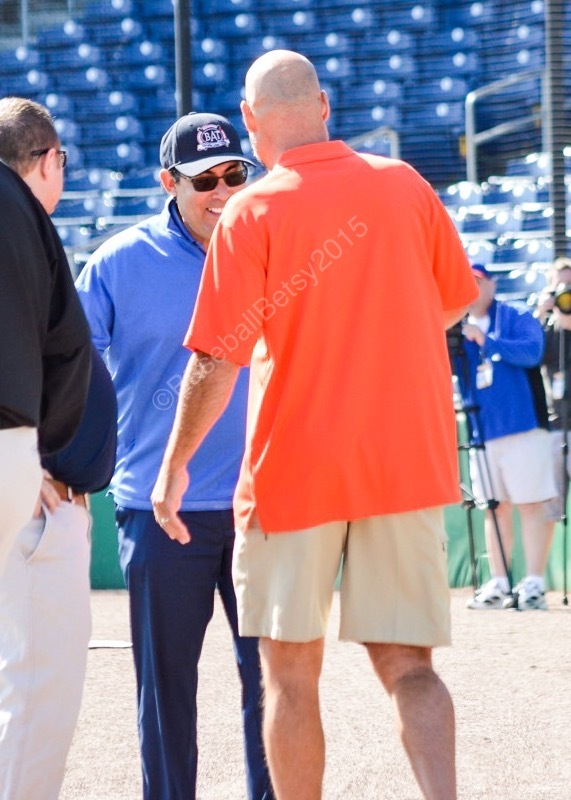 Say what you will about Ruben Amaro, he was genuinely happy to see Daulton as you can see in the pictures below. 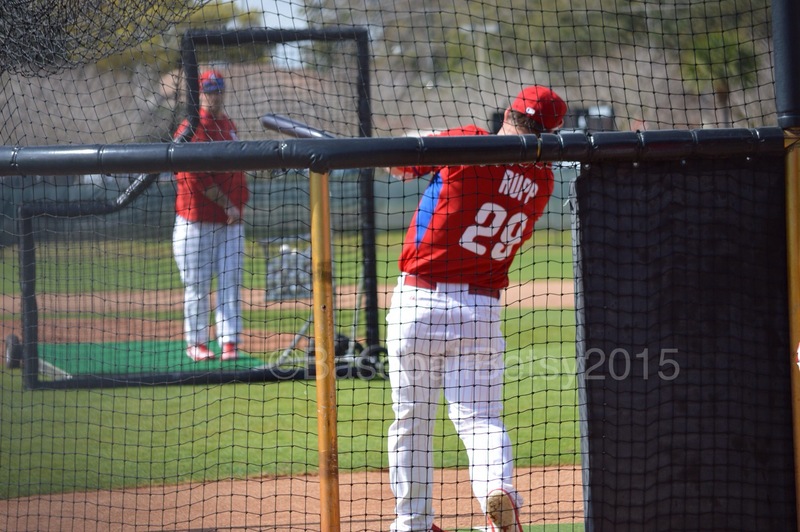 It was great to see Daulton so vibrant and full of life return to Spring Training. I was honored to be a witness. Finally, a “Chamber of Commerce” kind of day! After two days that were more like spring in Philadelphia rather than the beginning of Spring Training in Florida, the sun was shining and it was warm enough for shorts. Now this is the life! Baseball Ross and I got to the Carpenter Complex a little after 10. Since I had not had a chance to watch batting practice yet, we headed directly to Brighthouse. Batting practice is more laid back and the players seem to enjoy themselves more than during other drills. It’s the best place to get autographs as well. 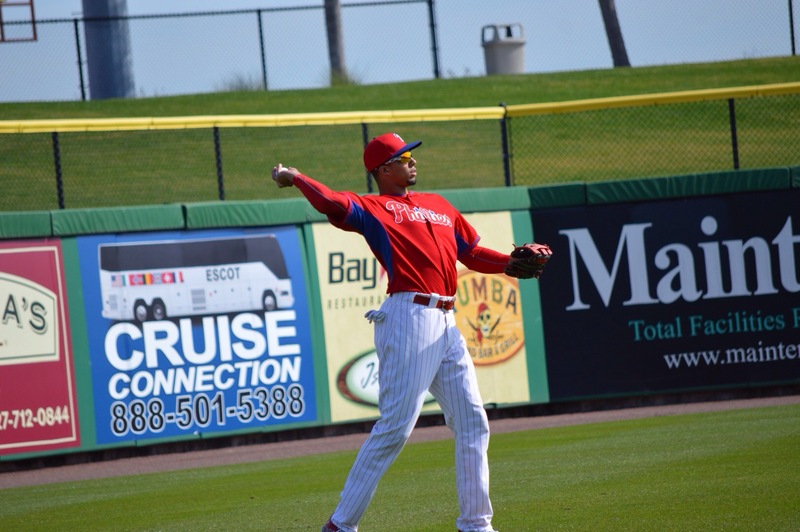 Aaron Altherr shagged flies in the outfield. You also get a chance to see players in a more relaxed atmosphere. Or may be they are thinking about the future. After batting practice, the infielders head over to the half field next to Brighthouse to participate in infield drills and consult with coaches. The half field next to Brighthouse where they practice infield drills. 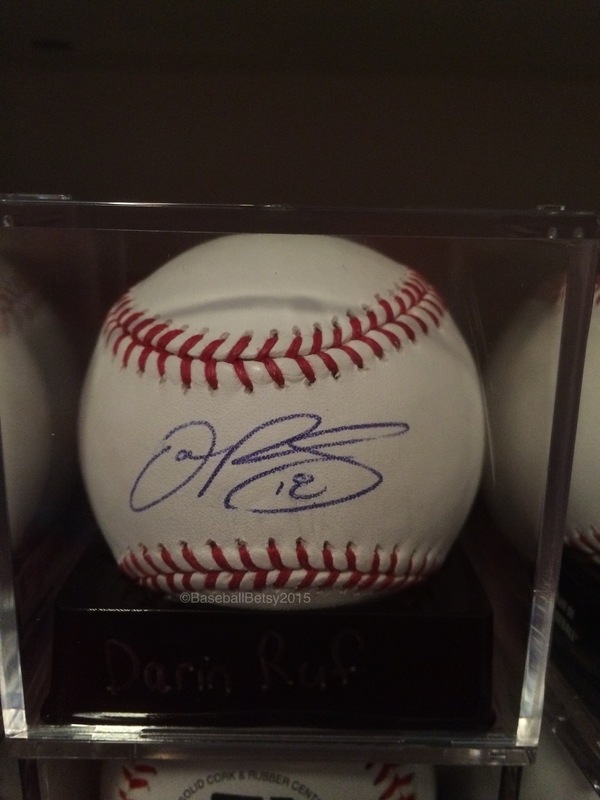 It was a great day and I was lucky enough to get Darin Ruf’s autograph! 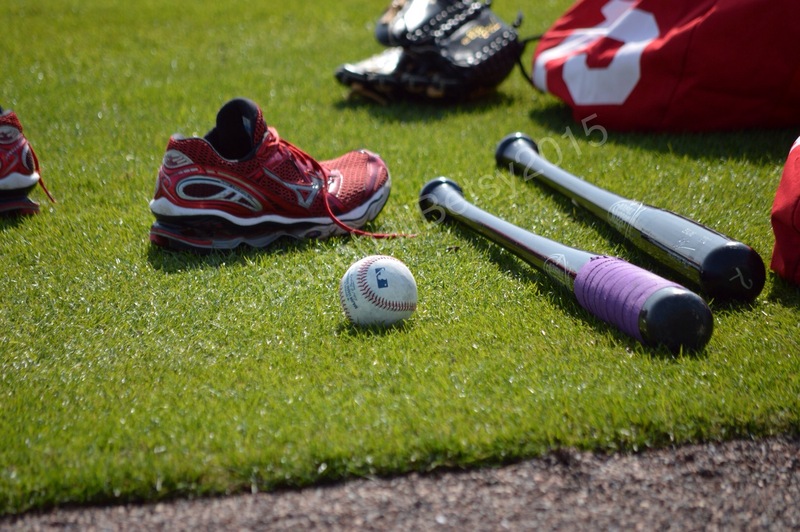 This is what I love about Spring Training and I can’t wait to go back tomorrow.